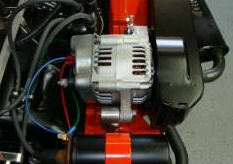 55-60 amp Alternator Kit for Type 3's. Will only work with 12v Shrouds. Comes with CNC Billet Bracket and Belt. No other modifications needed.